A transcutaneous electrical nerve stimulation, or TENS machine, provides pain relief by sending low-voltage electrical impulses through electrodes placed on the skin to a painful area on the body. A TENS unit can lessen pain without the use of medication. A TENS machine is generally considered safe. However, certain daily activities or medical conditions can contraindicate, or make inadvisable, the use of a TENS machine. According to the American Cancer Society, individuals who have heart problems or those who have an implantable device should not use a TENS machine. 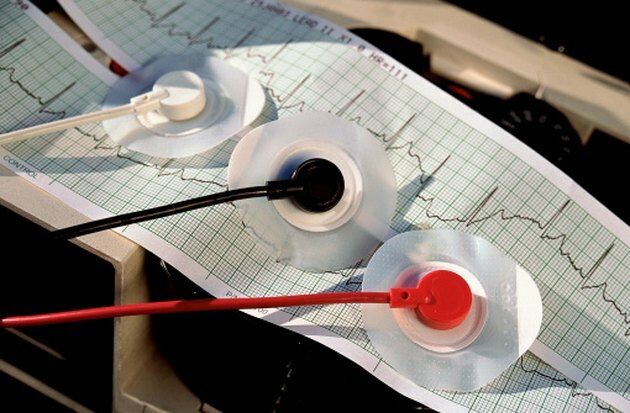 Implantable devices include defibrillators and pacemakers. Implantable devices work by delivering small, regular shocks that stimulate the heart to beat in a normal rhythm. A TENS machine consists of an electrical power unit connected by wires to a pair of electrodes. The electrical signals travel from the TENS unit through wires to the electrodes. A mild electrical current travels through the electrodes into the body, near the source of pain. The electrical signals the TENS machine sends may interfere with how the implantable device works. Pregnant women should not undergo TENS therapy. It’s not yet known what the long-term use of a TENS machine does to an unborn child, reports the American Cancer Society. Drugs.com warns people not to submerge themselves in water with the TENS machine turned on. The electrical impulses the machine operates on can send a shock if it’s submerged in water. Drugs.com warns people not to go to sleep with the machine turned on. A person who sleeps with the TENS machine on can’t feel the strength of the electrical current the machine sends. The machine can send electrical currents too intense and it can burn or irritate the skin. The Multiple Sclerosis Trust advises against placing the electrodes around the anterior cervical spine. Operating the TENS machine with the electrodes placed there can stimulate the carotid sinus. Stimulation of the carotid sinus can cause hypotension, or an unusually low blood pressure in people who have problems with their blood vessels. The American Cancer Society warns against placing the electrodes on the front of the throat and over the eyes or heart. A person who has seizures or convulsions should avoid placing the electrodes on the head or neck area, reports Drugs.com. The Multiple Sclerosis Trust advises against TENS therapy in people who have pre-existing lymphedema. TENS therapy has an effect on the circulatory system and it could adversely affect the lymphatic circulation, causing further fluid retention. The condition can compromise skin integrity because of the local tissue swelling that occurs. Other conditions that contraindicate TENS placement include areas of broken skin, sores or areas of acute eczema and psoriasis.